Last week before I went to Brisbane I was lucky enough to have the opportunity to help out a new friend with her very exciting new sock yarn business. She needed a hand preparing her sock yarn for its trip to Portland to attend the Sock Summit. I'm so jealous. Yes it is a four day kind of conference dedicated to knitting socks - can you believe it??! 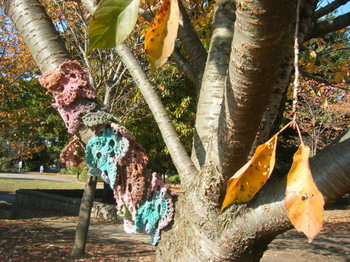 You can preview some of Ms Gusset's amazing hand dyed yarn here. Wow has it really been nearly three months since my last post. Not surprising really since we've been in a bit of a state of flux and we only got settled with reliable internet less than two months ago. We are slowly but surely finding our feet in our new home of Melbourne and lucky for us we had a few friends here already and especially lucky for me, I had a couple of great crafty internet friends that I couldn't wait to meet. One of them recently held a mending bee at her lovely home and I was lucky enough to attend. I took along six garments that needed some form of repair and came home four or five hours later with six repaired items - it didn't take four hours to repair them but if you add in talking and eating it all adds up. What a great day! Thanks so much for hosting Erin and letting us play in your craft room!! 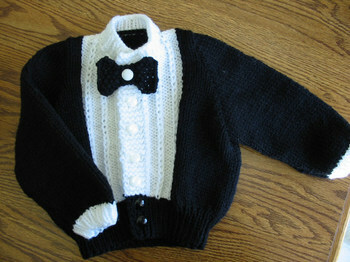 Thank goodness for talented people like Judy Lamb for posting free patterns like this Tuxedo Sweater!! Wow it's the last day of November! I can't believe that I pretty much managed to post once a day for 30 days. The content was not quite ground breaking stuff but it was enough to get me back into blogging! I don't think I'll be posting everyday from now, but you'll definitely see much more regular updates. 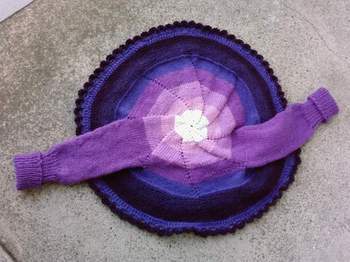 Here is a knitted FO that I'm pretty sure I never blogged about. They are pink so I figure it is appropriate to post a pic of them today. These are knitted slippers from some Japanese craft book. I sewed on some lambskin lined leather soles and voilla - winter slippers. I pretty excited about them because for some reason I threw out my other two pairs of slippers earlier this year and my feet were getting cold. I thought that I would buy another pair from Uniqlo but I came across these all folded up in my sock drawer - yay! I stayed up way too late last night knitting on Mary Jane. And I paid the price today. It's 10pm and I'm knackered. Blogging then going straight to bed!! Lucky it's a long weekend!! Here are some MJ progress pics. 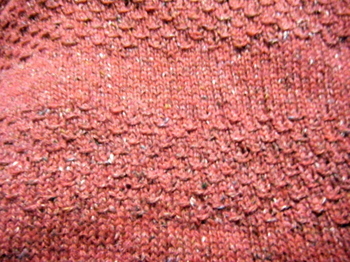 I'm using Rowan Felted Tweed in red. 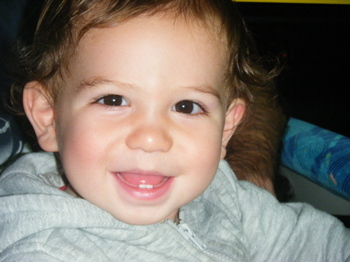 Oh and here's a pic of my smiling boy - just coz! You are such a copy cat! Wow my knitting mojo has come back with a vengeance! I seriously have had very little desire to knit this past year since J was born. Personally I think I was too sleep deprived and distracted. But now I really look forward to my knitting time after J goes to bed. The only problem is that knitting has NEVER been relaxing for me - it's way too exciting to be relaxing, so I end up staying up much too late!! I've been scouring through Ravelry more than ever lately and came across a very prolific and talented knitter in Malaysia whose knits are very flattering, well executed and of course are super cute. 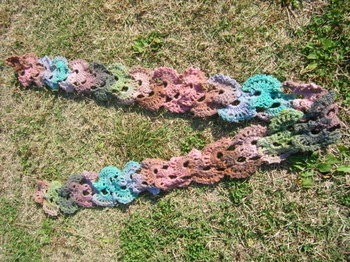 While checking out all of her FOs, I came across her scarf version of the fan bookmark crochet pattern. 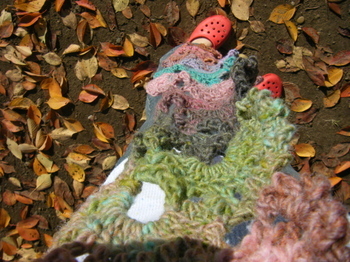 I immediately loved the colours and was keen to use some Noro Kureyon since I've never knit with it before. So after work I stopped by Yuzawaya (Japan's largest craft store, which just happens to be directly above our train station so I can pop in there very easily on the way home from work - this equals danger, danger!) and bought some Kureyon. I checked out all of the other colourways but had already fallen for colourway 215 which Loopy had used!! This is a very fast and easy project which would make a great gift for yourself or someone else. 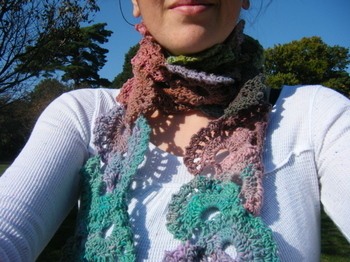 Shame the Kureyon is so scratchy though - it would be THE perfect scarf if it was soft and cozy. 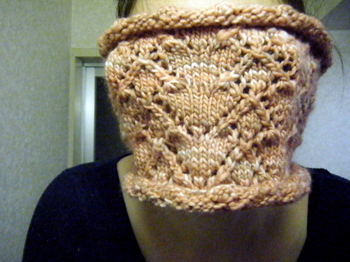 I've been a bit ambivalent towards the knitted accessory known as the 'cowl'. They are popping up all over the place. However I have a friend whose neck needs a whole lot of extra love right now, so instead of a scarf, I decided to dive into the world of cowl knitting. I'm a convert, people. 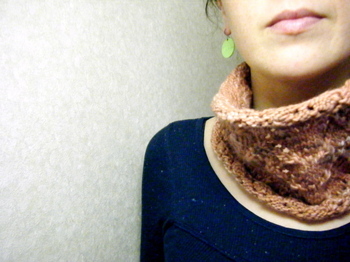 Cowls are warm and cozy and who knew that a keeping your neck warm would make your entire body feel warmer. I decided to knit Sandra's La la love you cowl from Popknits. I didn't have any MDU in my stash, but I did have some very luscious dusky pink merino yarn that I bought directly from Uruguay a few years ago. 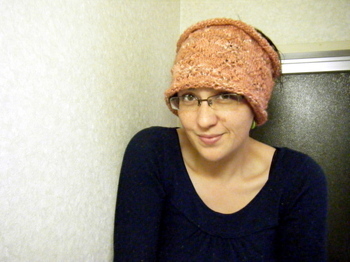 It's so soft and knits into a very sturdy and warm fabric. I really do love the end product and I hope my friend loves it just as much. I will be knitting another cowl for myself!! 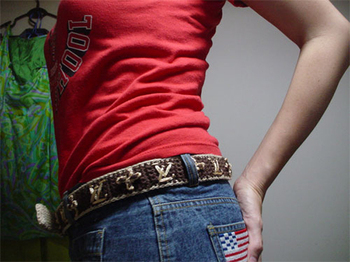 So much easier to deal with compared to a scarf!! This LLLY cowl still needs a blocking to really bring out the lace pattern, but it is cute nonetheless. I didn't deviate from the pattern much - I just cast on 12 less stitches. Actually I was going to cast on 24 less, but my circular wasn't small enough and I couldn't be bothered digging around for my DPNs. And who said a cowl can only keep your neck warm! Knitted fabric is so versatile! 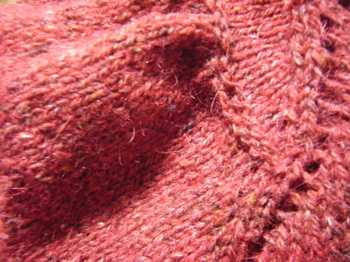 Wanna see that stitch pattern close up? Here you go! Thanks for such a cute pattern Sandra! A couple of years ago when J was just a twinkle in his father's eye and I was madly buying up as many Anti-Factory garments possible, the multi-talented visual artist behind AF, Stephanie Syjuco, started the Counterfeit Crochet Project. 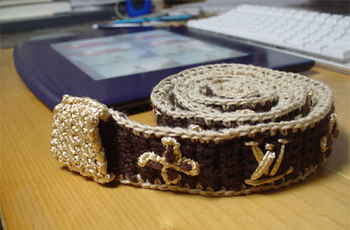 I participated in the project and crocheted a Louis Vuitton belt and had big ideas to do a bag too, but the yarn is still sitting in the cupboard. It may eventuate one day. Counterfeit Crochet is an ongoing project so if the idea of crocheting a name brand bag sounds like 'something you might be interested in', you should check out the details on the site and contact Stephanie. It has attracted a lot of attention and last year the CCP travelled to Beijing, Istanbul (particularly jealous that my belt made it to Turkey without me), and Manila. I've been meaning to blog about this for ages so I'm glad that I've finally found the time. Congrats to Stephanie on the success of CCP! Ooh yes a crafty post to start off the week. No babies here. How exciting! Well a year after J was born I'm starting to get my crafty mojo back, but alas I still don't have a lot of time to ACTUALLY craft unfortunately. I can dream though, right? So last week I bought a new Japanese craft book, which is exciting because I haven't bought one in a very long time. It contains a whole bunch of lovely wearable and cute sweater/cardigan and accessory patterns that are based on aran knitting - lotsa cables. I thought I would scan a bunch of picture to show you what is inside, but when I visited the Nihon Vogue website I discovered an AWESOME new feature. That's where the blog title comes in - 'tachiyomi' in Japanese means to stand and read. This is mostly encouraged in Japanese bookstores unlike in Australian newspaper shops. Anyways, Nihon Vogue has added a 'tachiyomi' feature to their new craft book online store, which means that you can check out 16 pages of any new craft book - it's REALLY good. It doesn't show you the whole book but definitely enough to whet your appetite. It also clearly shows the ISBN if you are keen to find a copy of a book you want. Under the picture of the book cover, there is a yellowy/orange button - this is the tachiyomi button - click it to view the patterns inside the book. 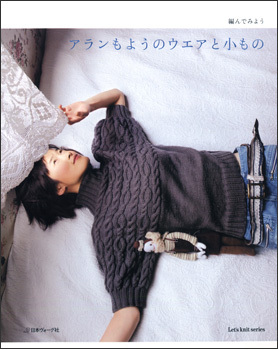 Go here to view more Japanese KNITTING books. Remember to click on the cover, then the tachiyomi button!!! Enjoy! 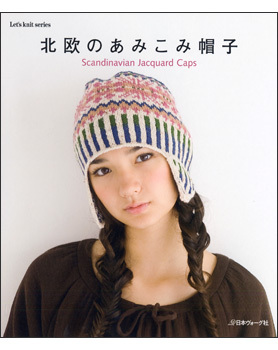 While we are here, I'm also loving this book - Scandinavian Jacquard Hats! 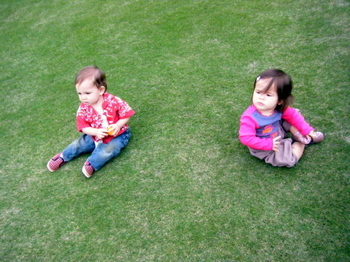 Check out the cute boy/girl white and red one. I'm so gonna knit this one. Pinwheel present for a pretty girl! I'm blogging on a Saturday which is pretty much unheard of, but J is napping so I seized the opportunity to start my month of blogging off on a good foot. So when J was small he had a harem of girlies to hang out with - it was great! But as is always the case in Tokyo people leave, so did two members of his harem....however one sweet girl (pictured on the right above) is still here and is J's best girlfriend! He used to ignore her but now they play together fabulously. They even had a joint birthday party since they are only 10 days apart. 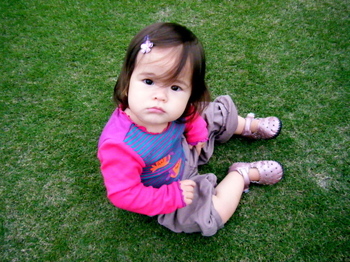 Today it is sweet Aisha's birthday - Happy Birthday Aisha from us! 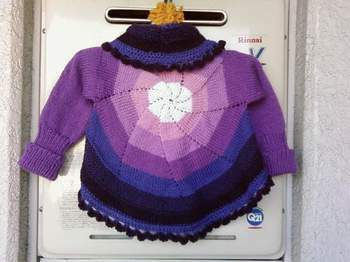 To celebrate her first birthday I cast on for a pinwheel cardigan for her and although it has taken a good couple of months of train knitting, it turned out well. 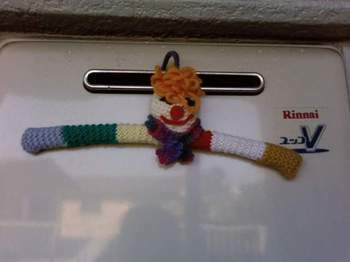 I haven't gifted the cardie yet, so no modelled photos, but I enlisted the help of clowny the knitted coat hanger to model the pinny. I did not knit this amazing coat hanger by the way - it was knit by my great aunty joyce - amazing isn't it??!! We have a bananas in pyjamas one too. I pretty much followed the pattern mostly, but after reading the comments about the pattern on ravelry and how the cardie was turning out small especially the armholes I made them bigger. I also for the life of me could not understand the armhole directions in the original pattern so i used the alternative 'afterthought heel' method for the sleeves!! Much better! I also made up my own crocheted edge which turned out pretty. It feels nice to be knitting again. 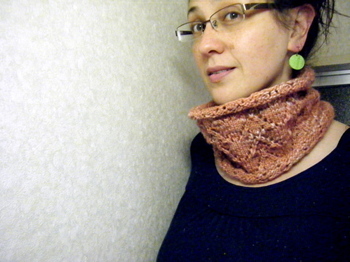 Next up, I'm going to knit the La la love you cowl by Sandra in the amazing Popknits! 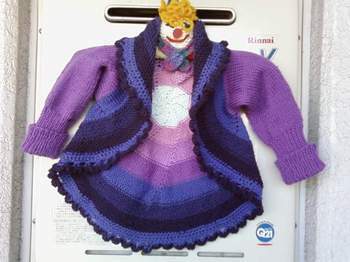 I hope sweet Aisha loves her cardie - it was knit with lotsa love.